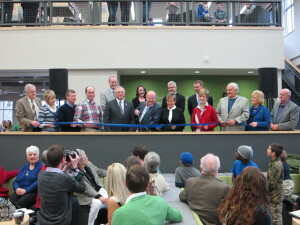 On Saturday, February 1, Central Baptist College dedicated the 16,094 square foot Story Library on the CBC campus. The event took place during the 2014 CBC Homecoming festivities with more than 500 in attendance. The just under $4 million Story Library completes project two of the Vision 2020: A Miracle in the Making campaign. The two-story facility includes the following: library administration staff offices, learning commons, 30+ computer workstations, 15 lap top plug-ins, five LCD digital signage displays, a multimedia classroom, Café 52 and café seating area, the Dr. Ronald V. Mitchell Archives, science resource center, media curriculum center, conference room, group and private study rooms, and book stacks. Café 52 was named to commemorate the year CBC was founded in 1952. The Café serves a variety of Distant Lands Coffee espresso drinks, smoothies, cold coffees, pastries, grab and go sandwiches, and chef choice dessert of the day. The Café is open to the public and its hours are 7:30 a.m. to 5 p.m. Monday through Thursday and 7:30 a.m. to 4 p.m. on Friday. Call in orders are available by calling 501-205-8821. The Dr. Ronald V. Mitchell Archives was named after Professor of Theology and History at CBC Dr. Ronald V. Mitchell. The archives identify, acquire and preserve material that document the history of Central Baptist College, the Baptist Missionary Association, and Arkansas Baptist history as it pertains to the Baptist Missionary Association and Central Baptist College. The Library was named the “Story Library” to honor the continued support of Max and Debbie Story of Magnolia, Ark. Central Baptist College is a four-year liberal arts institution with an enrollment of over 800. 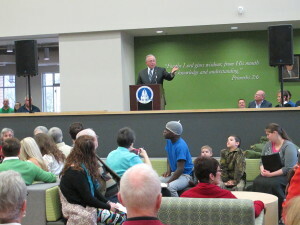 For more information on CBC or “Vision 2020: A Miracle in the Making,” go to cbc.edu.